Here we are again, folks! Week 33 of my hobby progress blog, well and truly on the slide down to Christmas! I’m actually really surprised I’ve managed to keep this up all year – not that I really expected to abandon it, of course, but more because I hadn’t thought I would actually be doing something hobby-related for all 33 weeks of the year so far! But anyway. I managed to get two days off work this week, and the weather was correspondingly awful, so I have quite a lot to talk about! First up, Deathwatch. It’s on everybody’s mind, no doubt, due to the ongoing releases coming out of GW. I’ve got ten of these guys on the go right now, five from Overkill and the five Veterans from Death Masque. Having primed them Chaos Black, I’ve been intending to follow Duncan’s tutorial and so painted the armour Abaddon Black, then highlighted with Eshin Grey and Fenrisian Grey. First of all, painting black on top of black has always made me scoff – I’ve never had to do it, but I’ve never really seen the point. Having now done this, I am a total convert to this idea! In many of the videos from Warhammer TV, they say how Abaddon Black has a different finish to Chaos Black, but they don’t tell you that Abbadon Black has a much nicer finish, which is what I find. It felt a bit foolish at first, but I could definitely see an improvement after doing just one marine, so eagerly did the others! Eshin Grey has proven to be an extremely subtle highlight, while Fenrisian Grey has gone over it far too brightly, so I’m really not happy with the look of these. I think I might need to start over, but I might try a much darker grey, maybe Dawnstone, rather than the Fenrisian they tell you to use. That said, I’ve tried edge highlighting in these as an attempt to begin to level up my painting, and my first attempts have not been a success! A lot of these marines have therefore been carefully, lightly drybrushed to highlight them, trying to only hit the edges and not the whole armour. At any rate, I don’t think they look all that great, so it might be back to the drawing board. We’ll see. Next up, the Vanguard Veterans I mentioned last week! Having rescued them with dettol, I’ve re-primed and sprayed them Macragge Blue, then drybrushed with Chronus Blue and washed them with Drakenhof Nightshade, as is my standard Ultramarine scheme. It could be my imagination, but the second paint job here doesn’t seem to have taken quite as I’d expected – the marines appeared to be shiny even after the primer, and I’m not entirely sure why. 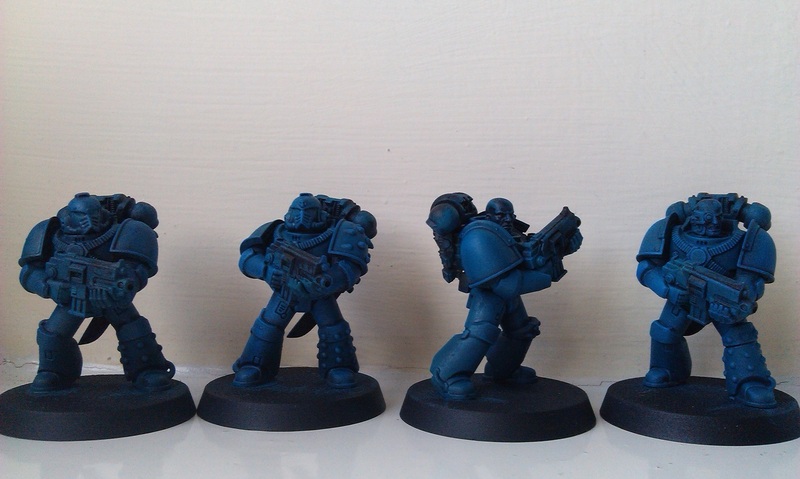 The four Alpha Legion guys have been base coated, washed and drybrushed with my usual scheme as well, so they’re coming along nicely. I’ve been thinking quite a bit how I’ve found these chaps really quite painless to paint, but for my Ultramarines, I seem to take a lot longer and agonise over the details – but they’re essentially very similar! Hopefully I can speed up with my Ultras, therefore, as I have rather a lot of them on the go in various stages, and would really like to have them finished soon! I’ve been building a lot of models this week, as well – Necrons, Terminators, Librarians, and more marines in general. As I said last week, it’s the time of year where I start to plan for the winter and, if I can get stuff primed when the weather is consistently good (well…), I will do! So let’s take a look at some new stuff! 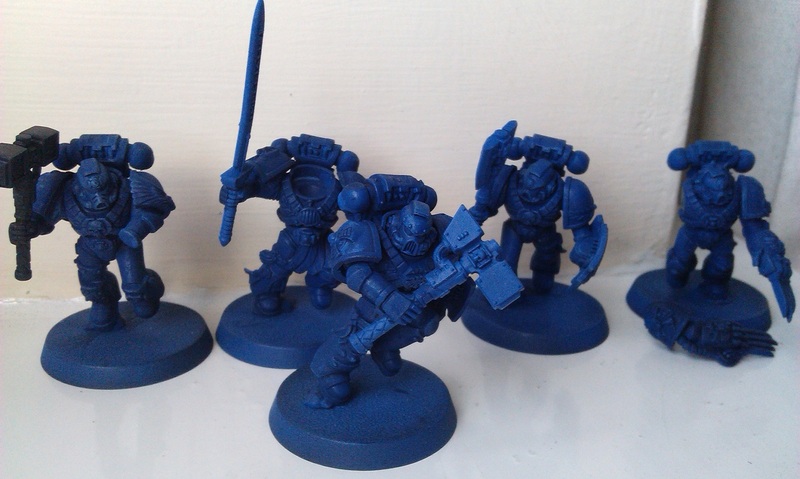 First of all, more marines – this time, Terminators! I love the Terminator kit, and even though it’s a fairly old sculpt now, I still think it holds up. There’s something of a classic look here that I really enjoy, anyway. They’ve had the same treatment as the Vanguard Veterans, so they’re ready for details to start being added in. Last week’s nostalgia prompted me to build up five Lychguard, who also turned out powdery and awful, but I think I’ve managed to save them with copious amounts of Nuln Oil! I think I’ve talked about this before, but as the Lychguard were the first Necrons I’d put together, all of my subsequent builds have seen me try to match that first paint job, and so I’ve never really had the chance to progress. These chaps, however, I’m hoping to see myself do something not necessarily wildly different, but I’m going to really try to make a good accounting of them. I still have five more with warscythes hanging about from earlier in the year that are also unfinished, and five with sword/shield from last year that need some work, so I’m going to be working on those side by side and see how they all turn out. 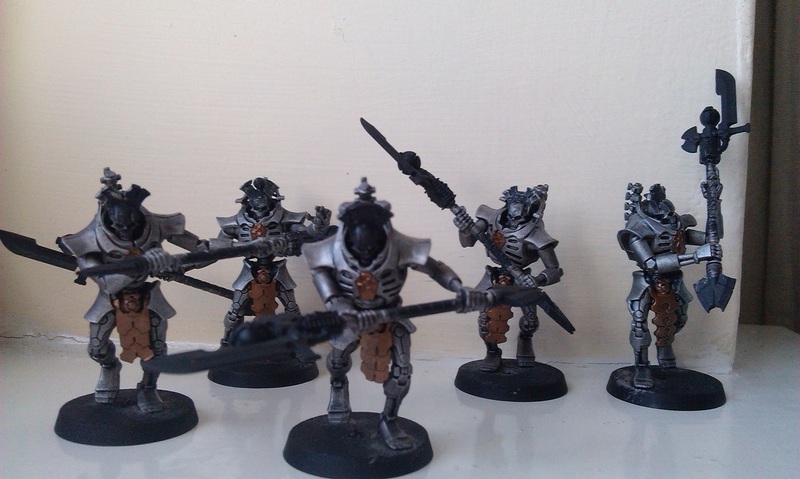 I think I could do with going through a lot of my Necrons and trying to improve them – the Triarch Praetorians, in particular, never ended up exactly as I’d have liked. Going through the DA Veterans bits had inspired me, however, to start building more Deathwing Terminators! The chap on the left has a storm bolter that has the Deathwing sword strapped underneath it as well as a shoulder pad from the Veterans box, while the sergeant on the right has the power sword, as well as a censer hanging from his belt. The Standard Bearer has a little shield thing with feathers also from the Veterans kit, but is otherwise pretty standard-fare. My original five Deathwing Terminators I built and painted earlier in the year are a mix of regular guys and Command Squad guys, and reading the DA codex, I think I need to make all five from the Command Squad in order to field it, so I’m trying to build marines that will allow me to bulk those five out into two separate squads. So the plan, ultimately, will be to have three squads of the terminators, one squad of the Knights, Belial, the Venerable Dreadnought, and a Drop Pod and Land Raider. Though I’m seriously thinking about making at least one more dreadnought. I’m not going for the whole Dark Angels force, as I only want the Deathwing because the colour scheme is one of those 40k schemes that genuinely excites me. But anyway! What else have I been building? Oh yeah! Having built up three Devastator marines back in the spring, I’ve finally built the remaining two – and the armorium cherub! I don’t know why I seem to build things in threes, though painting the Maximus marines has shown smaller numbers tend to focus me somewhat. Anyway, I’ve finally got the five done, and I have to say, the Devastator kit is absolutely incredible for the number of spare bits you have in there! I put a photo on instagram (if you don’t follow me there, why not?!) that shows the sprues as they are once all five marines are built, and it’s incredible! So many weapons options for the sergeant alone! But so many spare heads, hands, it’s all just amazing! I reckon all you’d need is some legs and backs from a bits seller and you could make at least three more marines out of this kit! Totally awesome! 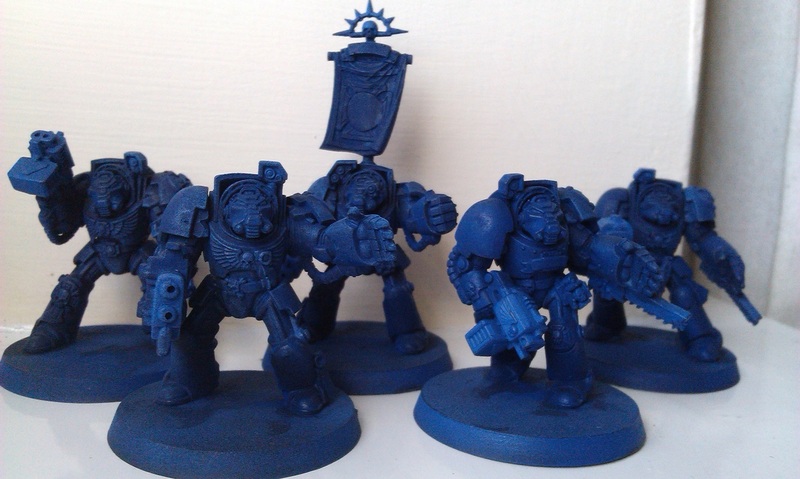 I have no idea if the Ultramarines use cherubs in the fluff – they always seem to be a Blood Angels thing in the artwork we see – but built one simply because I could. I also want to challenge myself to paint more flesh, so it’ll be a good thing for that. Blood Angels have rarely interested me, as a colour scheme. I don’t think I’m very good at painting red, and I find that the colour is far too strong sometimes for its own good. The lore of Blood Angels is somewhat interesting, but I don’t find myself drawn to it in the same way I am to the Ultramarines, which might sound odd to anyone familiar with the lore, but anyway! Reading the Shield of Baal novellas almost two years ago was a lot of fun, though, and given that box came out very soon into my hobby career, so to speak, I do find myself quite nostalgic for Blood Angels because of that. I’ve also recently found myself thinking about trying a different marine force, just to keep my motivation going. In that respect, the Deathwatch have come along at a good time, as I had been looking at the Start Collecting box for the Blood Angels. Much like the Space Wolves, I like the idea that the kits they have are full of chapter-specific sculpts, rather than the more generic stuff that you can buy upgrades for. It’s really only those two chapters who have this as well, as the Dark Angels, for all the fact they have their own Codex and the like, the marine kits are generally the standard line. Anyway, I’m kinda rambling here. The main thing is, I liked the idea of having a really customised-looking force. So that’s been my week! Pretty huge, I have to say, but enjoyable, as well. The primer issues I’ve had have caused me to lose some faith in my painting in general, but I’m powering through those currently. I really want to just keep painting, and try to get to the continuous improvement stage where I can try new things and, as I mentioned, really level up my painting skills. Next weekend is the Bank Holiday weekend, and I’m hoping for more fun and frolics with painting miniatures there, as well. Then for September, I have a sort of mini-project planned, which I hope will be very exciting indeed! So stay tuned for that! Hi! In your comments about Deathwatch, you mention Duncan’s tutorial about painting black. Would you happen to have a link for this video?